From bustling cities to quiet mountain villages, experience the distinct flavor of Japan during this amazing vacation. Discover Japan’s culture as you try on a traditional kimono, partake in a tea ceremony, taste sake, attempt calligraphy, learn about the Yuzen dyeing technique used on kimonos, take part in a gold leaf class, browse a farmers market, and participate in a Japanese cooking class. 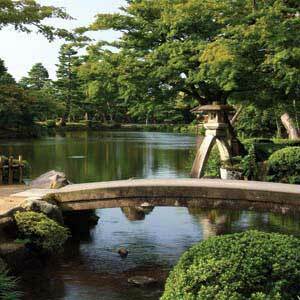 Of course, you’ll visit Japan’s famous sites, including many of its castles and shrines. In Kyoto, see the Temple of the Gold Pavilion, a Buddhist temple covered in gold leaf, and be amazed at its beauty. In Nara, visit Todaiji Temple, a UNESCO World Heritage Site built in 752 AD and one of Japan’s most significant temples. You’ll also visit Matsumoto Castle, a must-see sight in Japan. Dating from 1593 and designated a national treasure, it is Japan’s oldest existing castle tower. Beyond the fascinating structures and shrines, you’ll also have a chance to visit one of Japan’s greatest gardens—Kenroku-en. According to the ancient Chinese book of gardens, gardens should have six different sublime qualities, but it is rare to find all six qualities in a garden. Dating from the 1670s, Kenroku-en does, in fact, combine the six attributes of a perfect garden—spaciousness & seclusion, artifice & antiquity, and water-courses & panoramas. At the end of your journey you’re sure to have lots of stories and photos to share with loved ones back home! American breakfast daily, 3 lunches, 5 dinners including a welcome dinner in Tokyo and a farewell dinner in Kyoto.